Sure-Grip has come out with a new version of their poms. These new poms are slightly larger than the original poms that we’ve been selling for many years, but they’ll be the same cost to you. The Pacer Stratos skates have been out for a little over a month now and we’re getting good feedback on them. 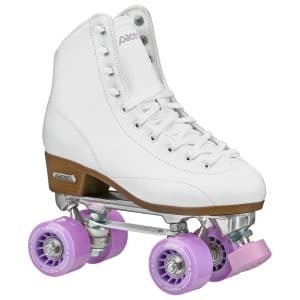 This is a very traditional looking high-top quad skate that is perfect for beginning class skaters. It reminds us of the Dominion Esprit package. As we get close to the Christmas rush, here are some notes on our inventory that might be helpful. . .
Comet – We are still out of the white sz 3, but hope to get a shipment before Christmas. All other sizes on the current colors are in stock, plus we have a lot of the silver and purple versions on the closeout sheet at big savings. Sure-Grip Prism – They showed this skate at our tradeshow, and also have done a couple of email blasts to promote it. 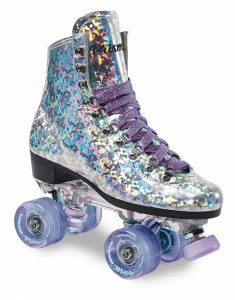 It is basically the Stardust skate in two different great new prism colors. These are expected to arrive approximately Dec 10. 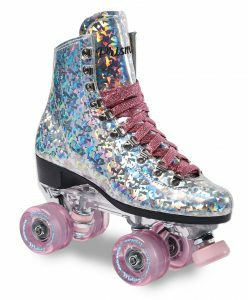 Roller Derby’s Flux and Carver inline skates are now in stock and ready to ship. 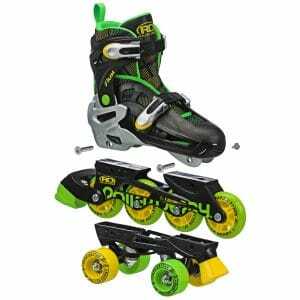 The Flux has a removable base, so you can switch between inline skates and quad skates. 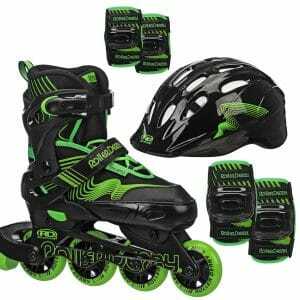 The Carver is an inline skate with protective pads included in the kit.